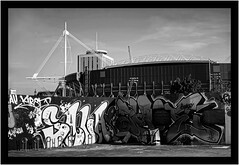 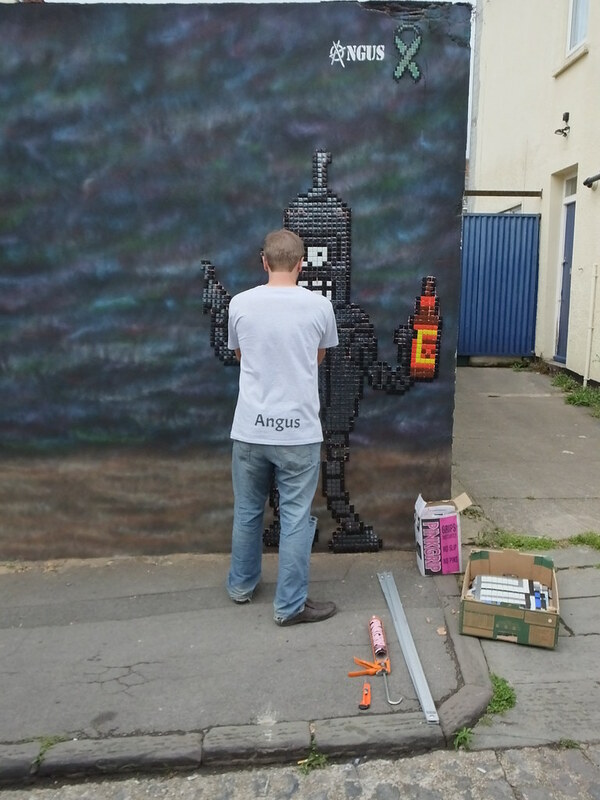 Local artist Angus has now been selected for three years consecutively to attend the street art and graffiti festival ‘Upfest’. 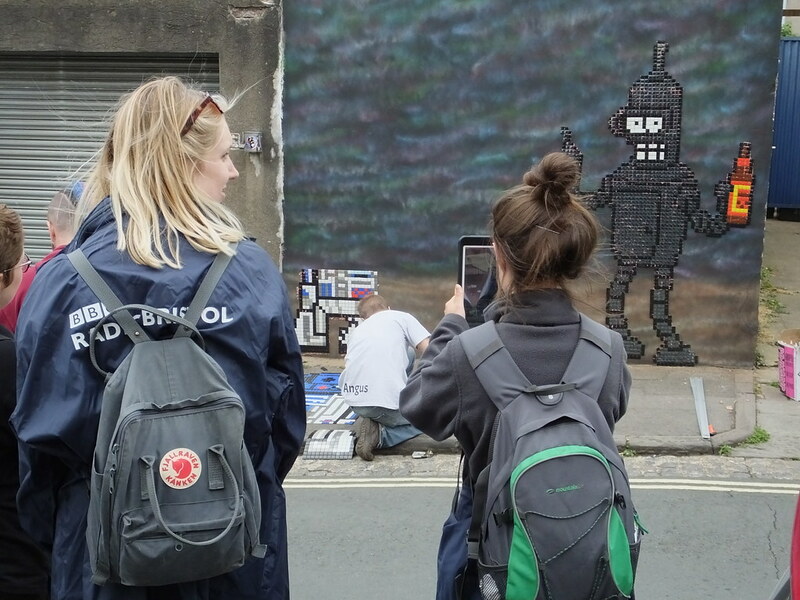 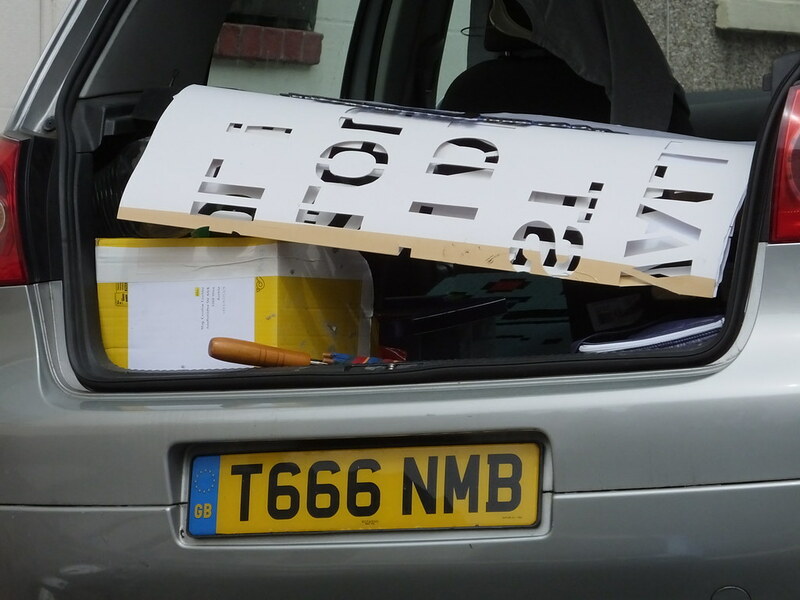 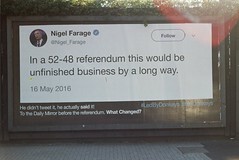 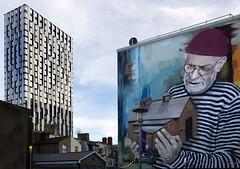 Held for it’s tenth year now – Angus is no stranger as an artist to his home town of Bristol where the festival takes place over the last weekend of July. 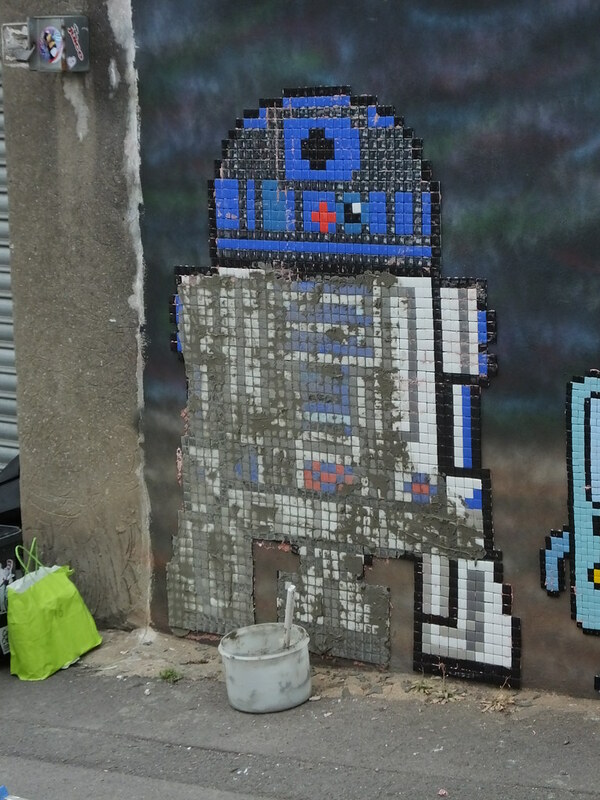 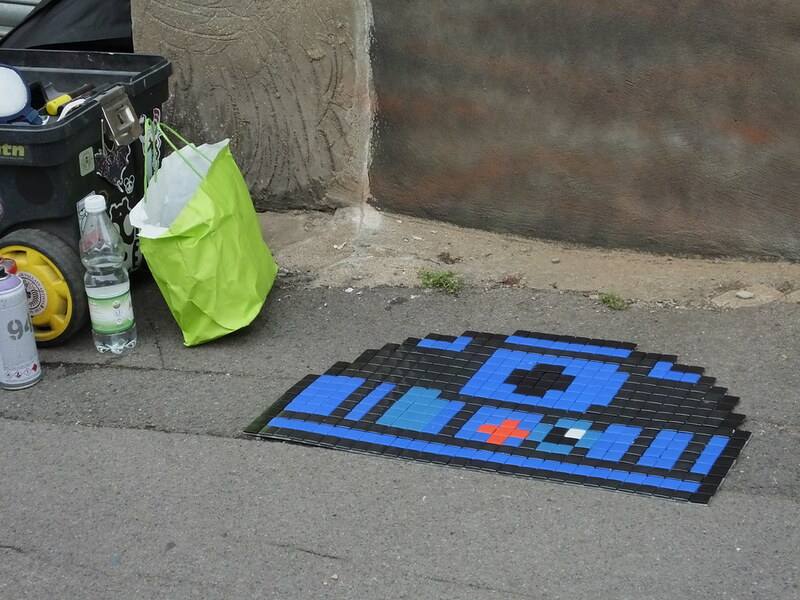 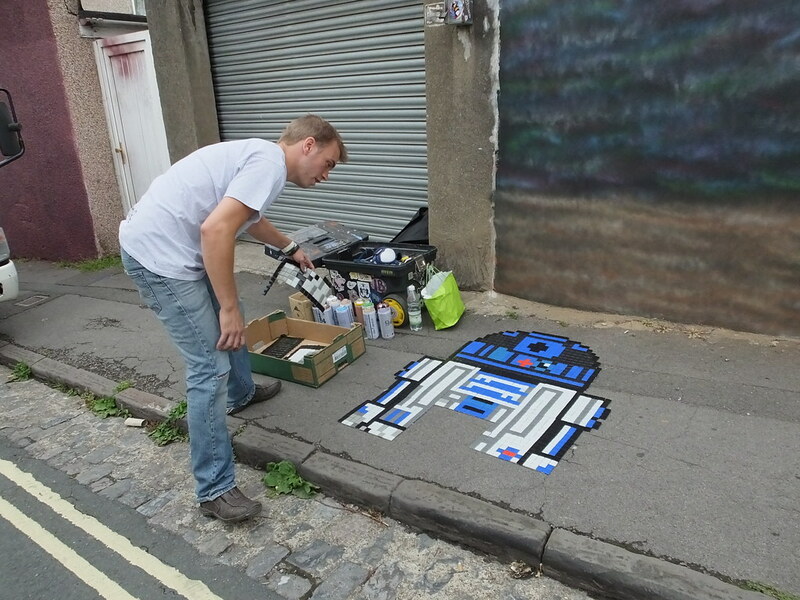 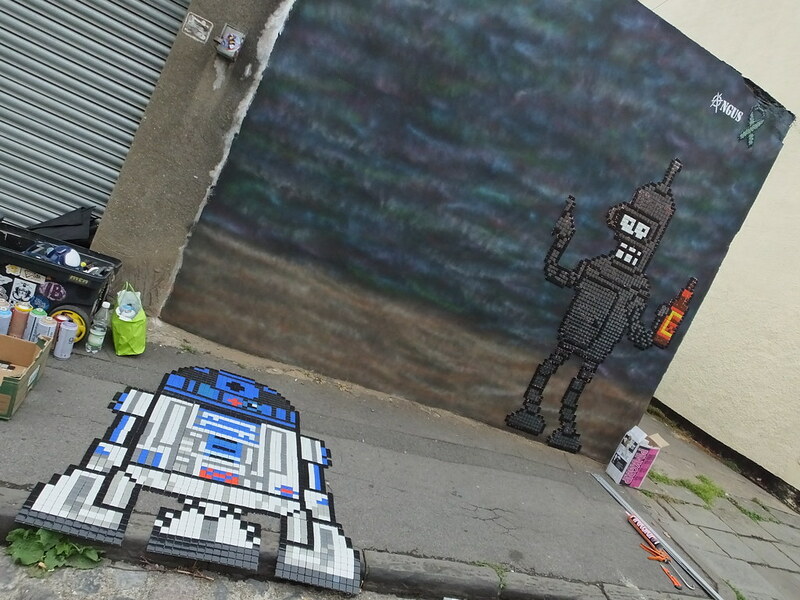 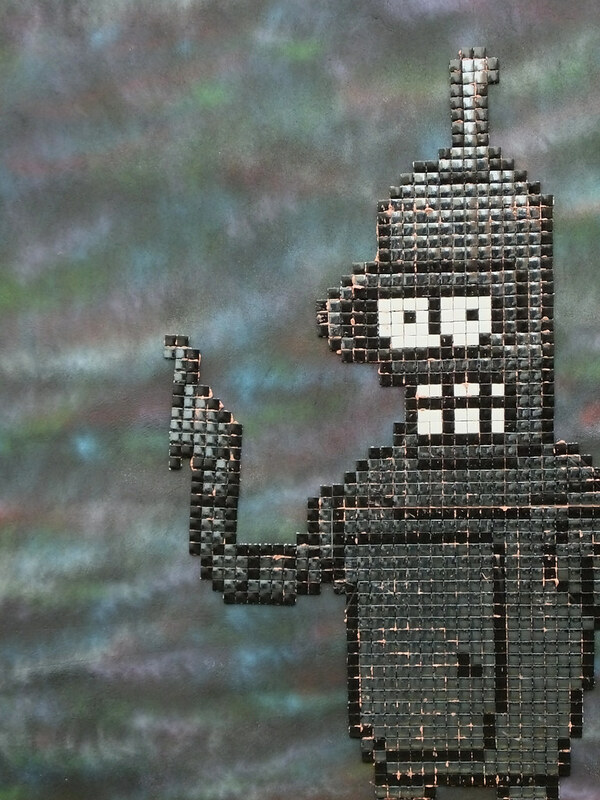 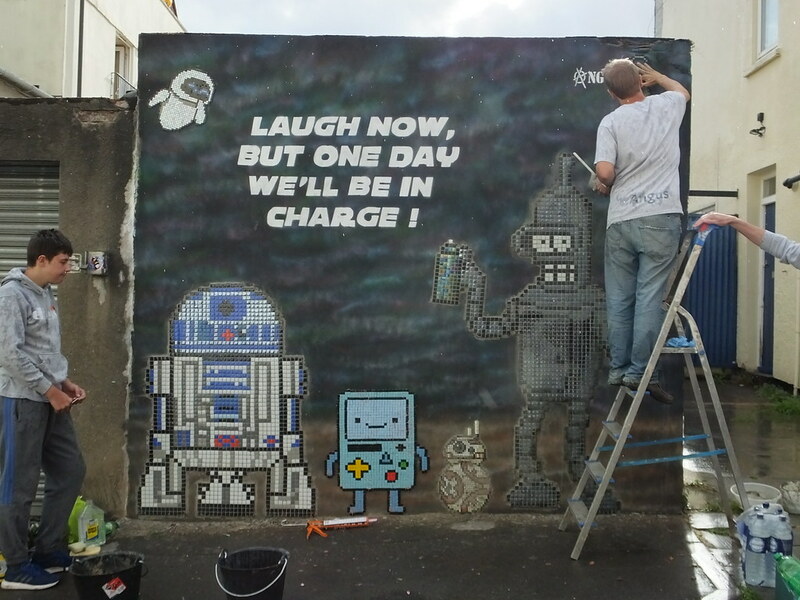 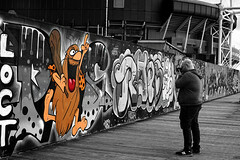 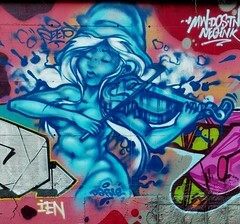 His recent work has featured themes from cartoon characters to vintage computer games and here is no exception. 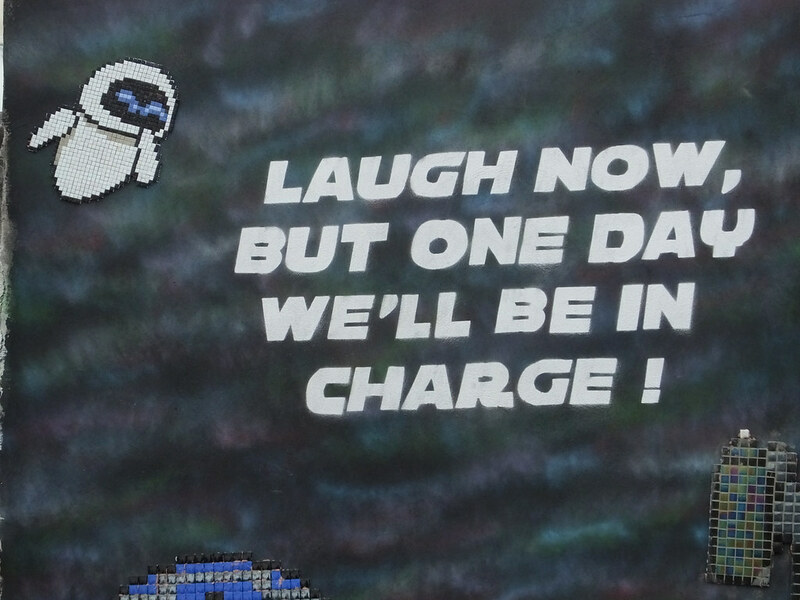 Angus’ work also contains a lot of humour as demonstrated by the original state of his wall as the festival began! 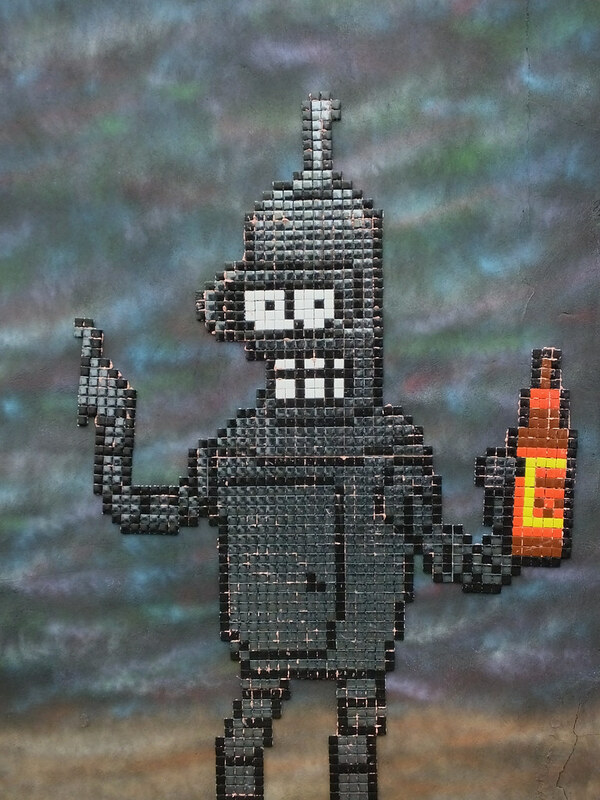 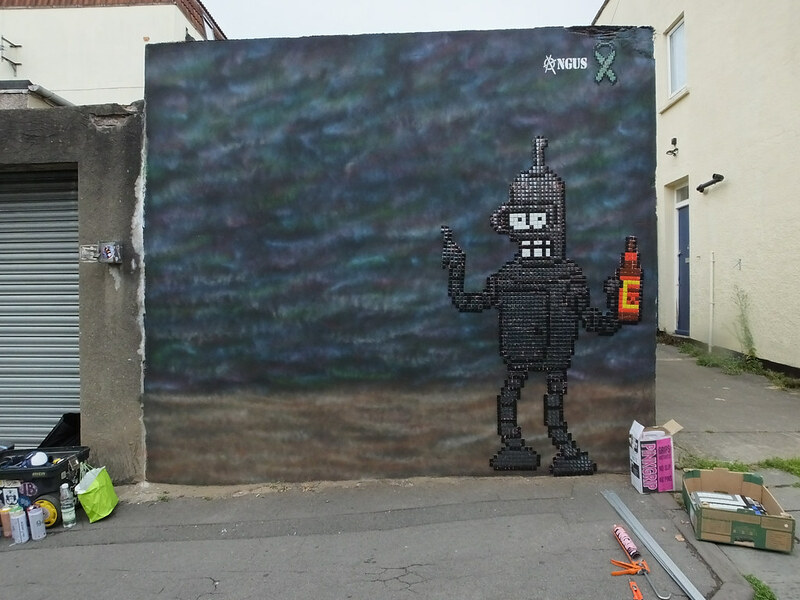 The wall was prepped and a spacelike background added before the first of many robot characters was applied to the wall beginning with Bender from Futurama – yes that is a beer in his hand! 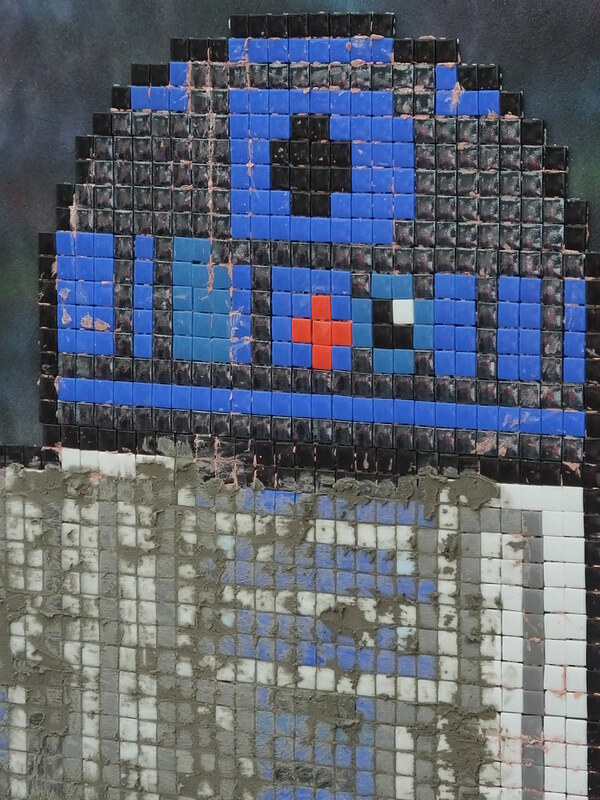 The next robot was carefully revealed and pieced together on the floor before some very strong pink adhesive was applied to the back of R2D2 and then piece by piece was stuck to the wall. 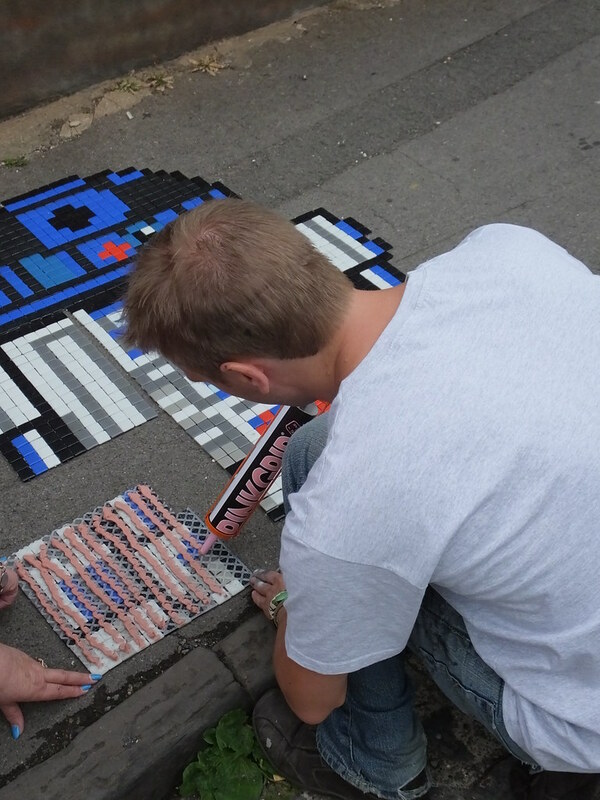 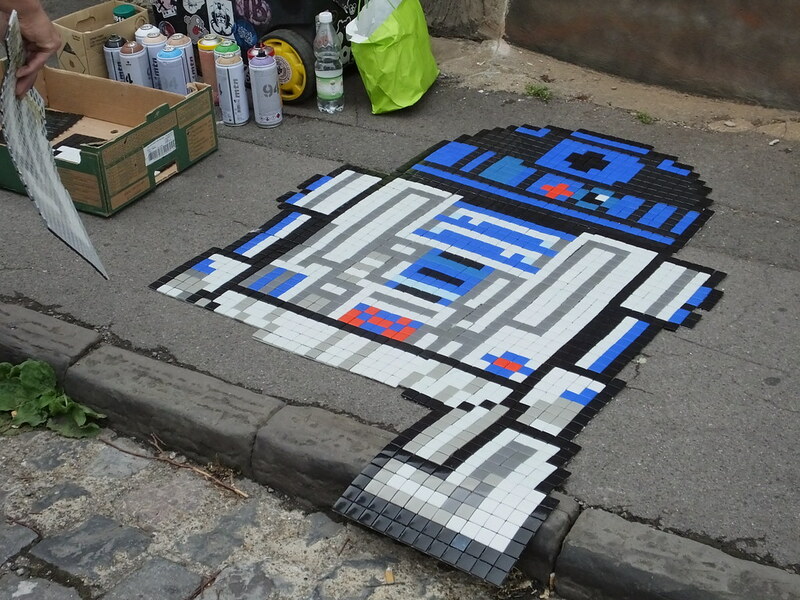 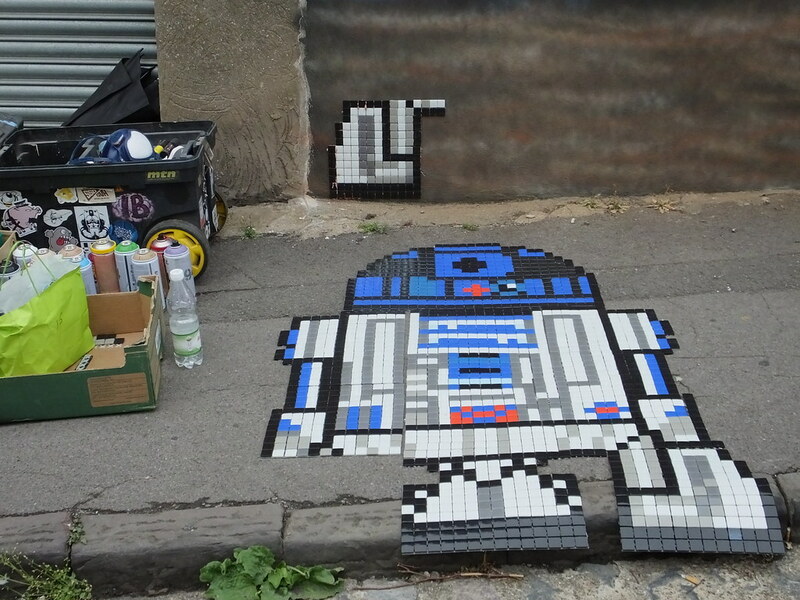 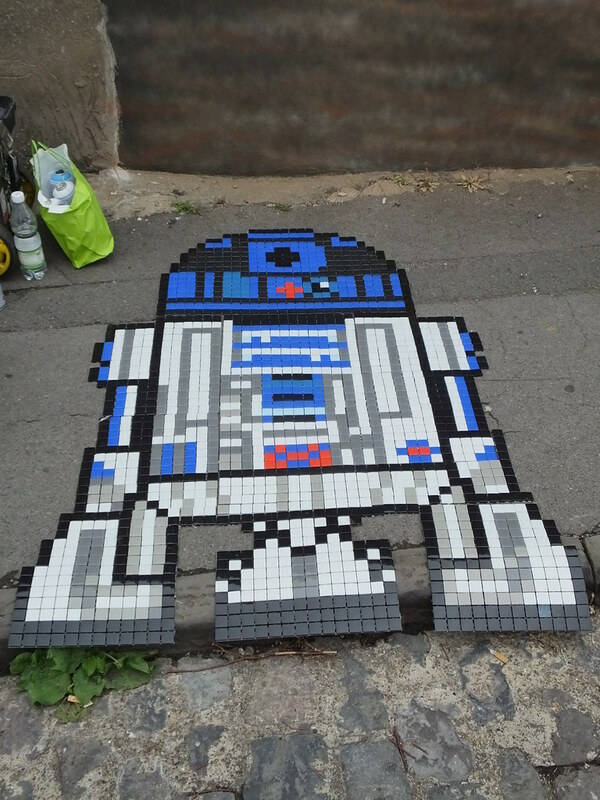 A crowd gathered to watch the impressive artist at work and see how critical the placement of each tile was as the R2D2 robot took shape. 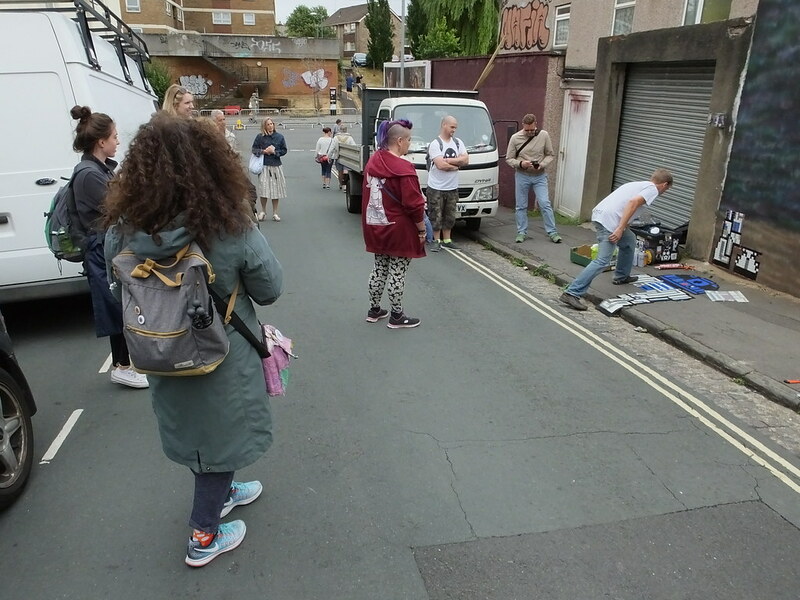 There was time for a quick stroll around North Street to catch up on all the other great street art by just a few of the 300 invited artists to the event. 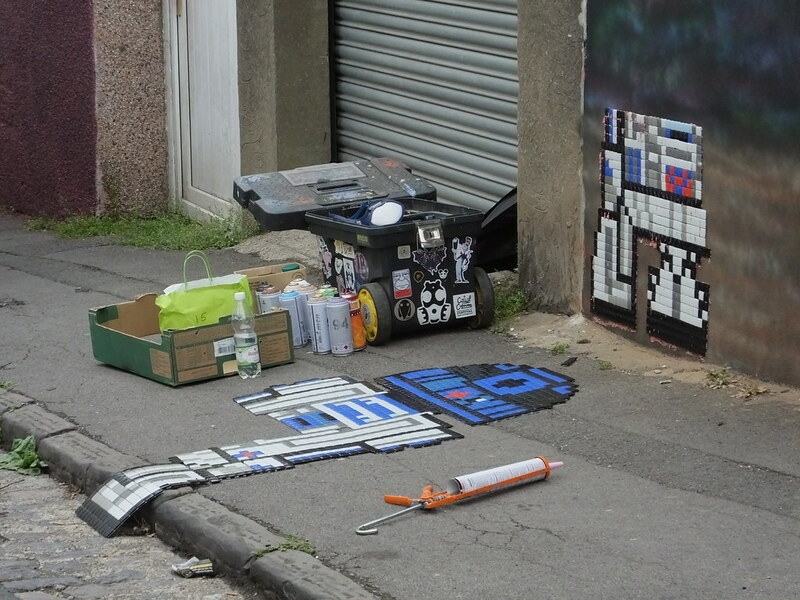 On returning to this spot Angus had completed all the robots which now included R2D2, BB8 and Eva on his masterpiece. 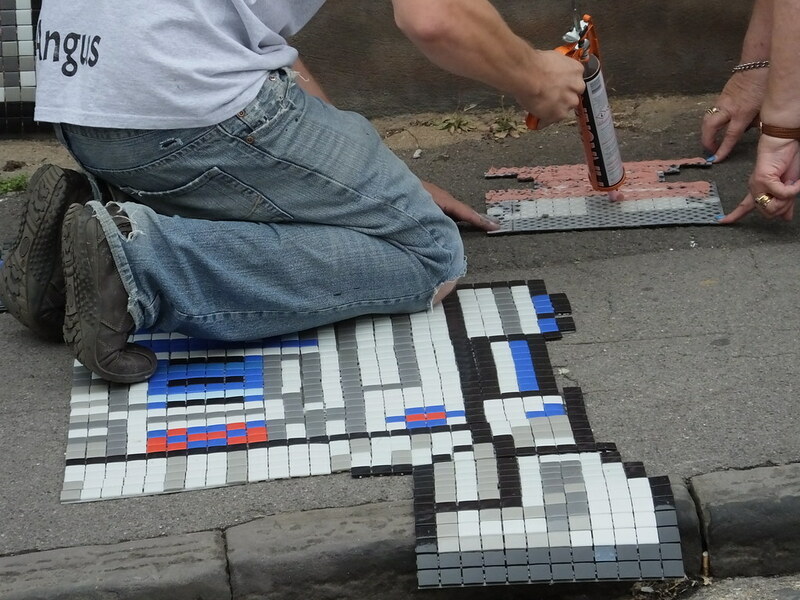 Next the grouting was being applied to help weatherproof the installation. 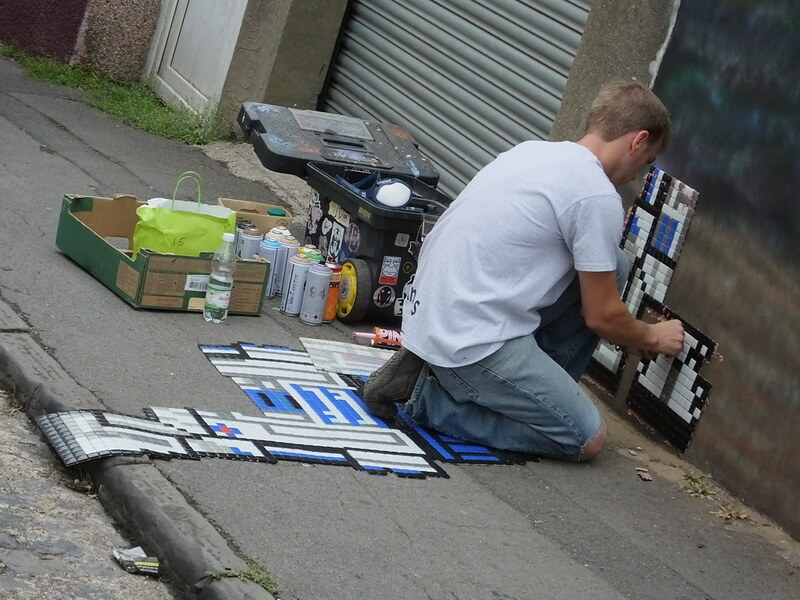 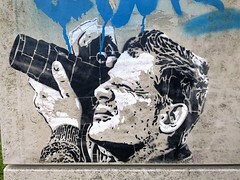 Angus has produced some fantastic work over the last few years and usually combines stencil with his tile art. 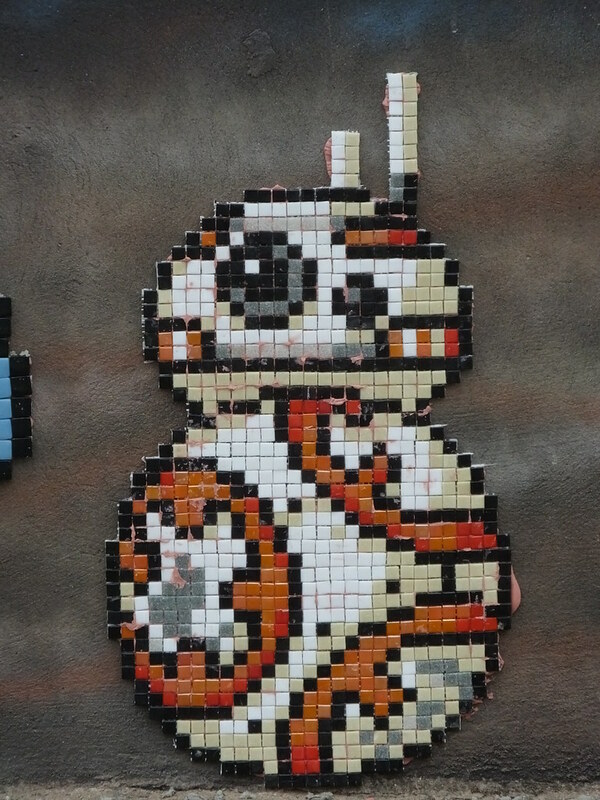 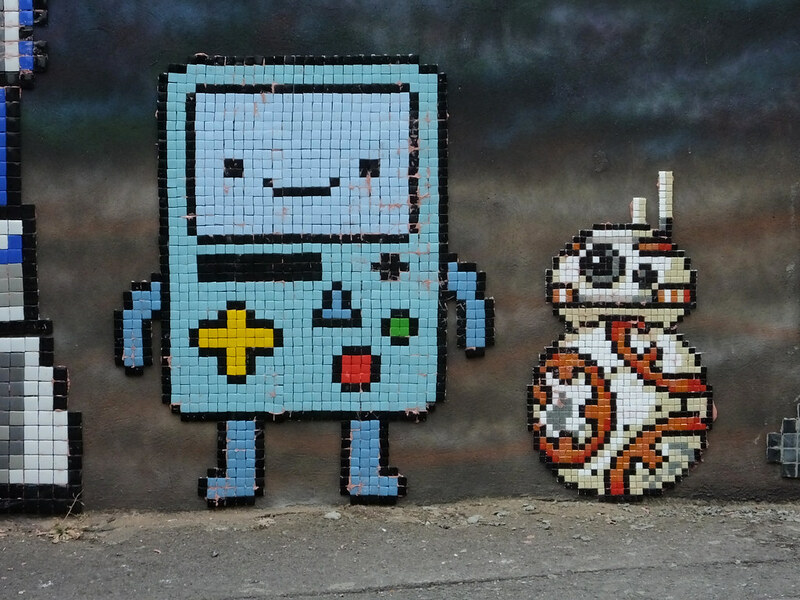 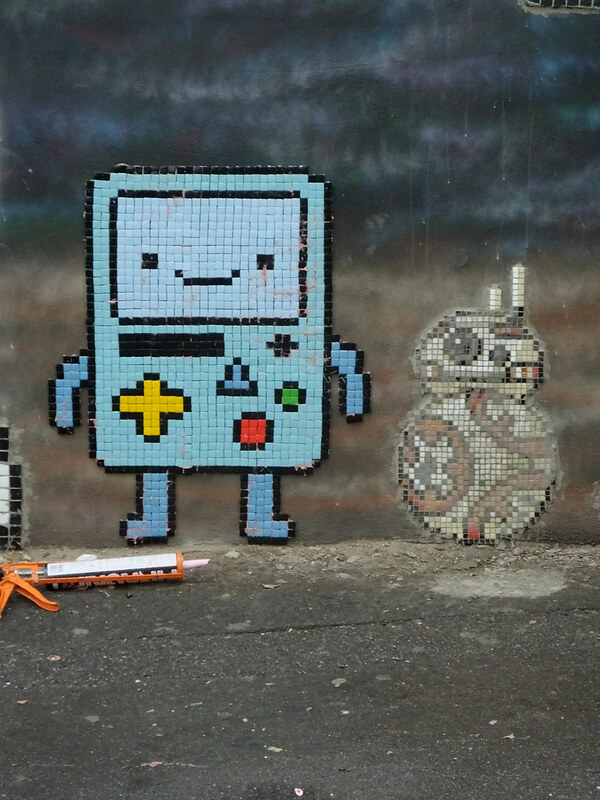 A small BMO from Adventure Time was proudly sitting next to a BB8 – whom is shown above before and after a wash down! 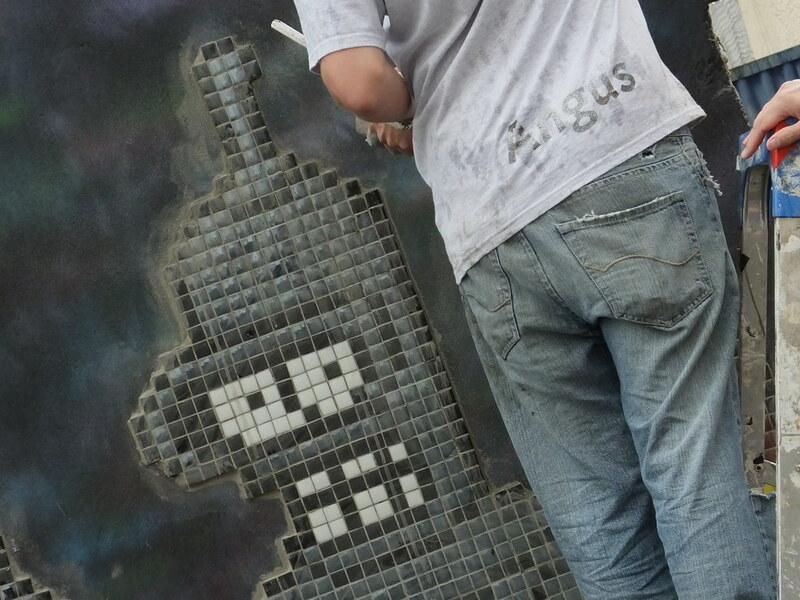 This highly skilled piece was carefully crafted throughout the day and once ready the grouting was washed down to reveal all of the gleaming tiles! 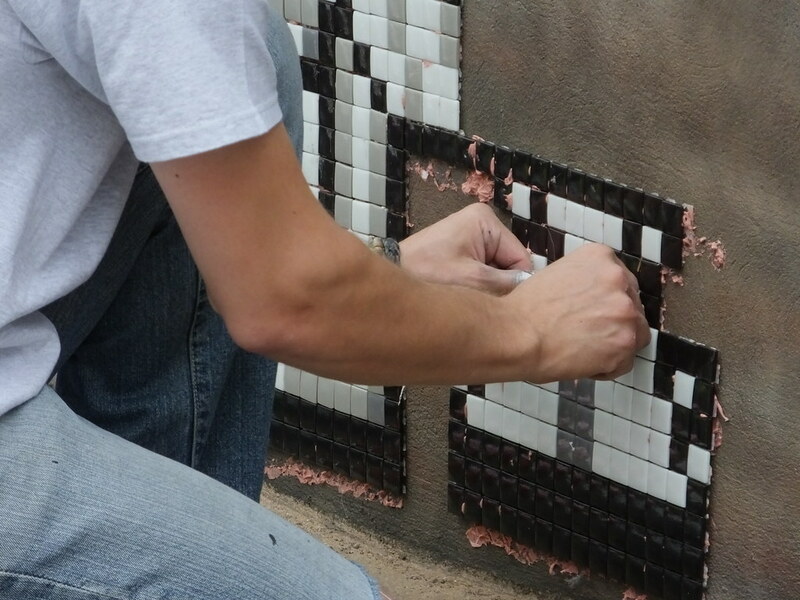 A brief video below showing just a small portion of the hard work that goes into these mosaic murals.